A request has been made I transcribe this chapter. Mrs. Mary A. Burgess-Oster was among Liberal’s pioneers who well deserves mention in any story of the town. She was a prominent citizen for many years; and more than some others have done, she left a monument to her memory–the Burgess tomb. She experienced five marriages. Of her five husbands, two she divorced, two she outlived and by one she was survived. As a young woman she was married to Samuel Boulware, a member of a prominent pioneer family of west Barton county. This marriage proved incompatible and ended in divorce. Some said Mr. Boulware was not sufficiently successful financially to satisfy her. Her second marriage was to Alfred Burgess, another pioneer. Mr. Burgess was a man of wealth, and much her senior. From him she came into a considerable fortune. An addition to the town of Liberal bears his name. After the death of Mr. Burgess the widow married a Mr. Olmstead, a stranger here, and from him she was soon divorced. Mrs. Burgess was a most gracious lady, but homespun through and through. She had been used to the rugged, more or less “catch as catch can” pioneer life, with farm animals all around. Mr. Olmstead was from the city and fastidious to a fault. Mrs. Burgess said he was so finical she couldn’t stand him. Among other niceties, she said he complained of soiling his shoes when he had to walk in the cow lot. This was too much! Her fourth marriage was to Louis A. Oster, a wealthy retired and German farmer who had come from Illinois and bought considerable land in this vicinity. Mr. Oster was much the older of the two, but it was a happy marriage. Among other events, they enjoyed a visit to his native Germany. In his passing he left more wealth to the widow. With money from him she invested in land. The fifth and last in the line of husbands was Robert Schmidt, of Kansas City, a stranger here. How she met him is not known. By him she was survived. There were no children of any of the marriages, though she and Mr. Burgess did adopt a son; and later, she took a girl and another boy to raise. It will be noted the name “Burgess” is being used throughout this sketch. The reason is because by that name she was most generally called, with the name “Oster” following a close second. Mrs. Burgess-Oster was one to prepare for the dead as well as to provide for the living. In testimony whereof, there now stands in the northeast part of Liberal a large above-ground tomb, or vault, wherein rest the bodies of Mr. Burgess; the body of her mother, Mrs. Sarah E. Peck, the body of Mr. Oster and, finally, the body of herself. The tomb stands on a plot of ground, 80 by 205 feet in size. To insure perpetual upkeep, she deeded the plot to Barton county, and set up a trust fund to provide money for any expense of upkeep. The trust fund, opened at $500, was reduced to $450 by the inheritance tax. The deed was made July 6, 1896. The vault, about ten by twelve feet in perimeter, and eight feet high is built of stone and glazed brick. The plot was taken out of a track of land–her home at the time. 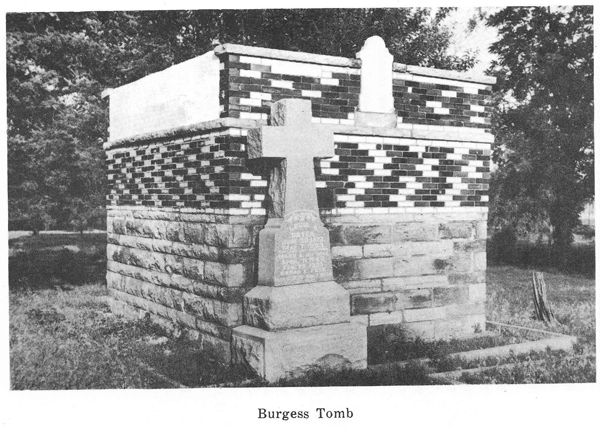 “I, Mary A. Burgess, a single woman, being desirous of securing a private burying ground on my land, for the purpose of retaining the remains of Alfred A. Burgess, deceased, now entombed on the tract of land hereinafter describe,d and for the further purpose of making the tract of land the final resting place of myself, my mother and my adopted son, Clarence A. Burgess, when we severally shall pass away from the burdens of this life, do hereby grant, bargain and convey to the County of Barton, in the State of Missouri, the following piece, parcel or tract of land: Commencing at a point where the east line of Burgess street, which runs north and south through Walser’s First addition to the town of Liberal in Barton county, Missouri, intersects with the south line of Lot two, in township 32 and range 33, running thence west 205 feet, thence north 80 feet, thence east 205 feet, thence south 80 feet to place of beginning.” All named except Clarence A. Burgess rest there. As often happens to celebrities, stores are told of their eccentricities–of course sometimes exaggerated. Mrs Burgess did not escape, and I mean no disrespect in relating some of them concerning her. There is the story that upon her remarriage after the death of Mr. Burgess, a charivari crowd went to her home the first night and raised a din that fairly “made the welkin ring.” Provoked, it is related that she commented, “The way they carried on was simply disgracefully, there with the body of poor Mr. Burgess yet not much more than cold in his tomb.” The tomb was near the house–something near seventy feet distant. She always referred to Mr. Burgess as “Poor Mr. Burgess.” How long she waited to remarry, I do not know, but I imagine it was within the range of propriety. The charivari crowd, no doubt, milled some around the tomb. Maybe it was rude to poke fun at her, or even to speak of her eccentricities. But otherwise the story and the picture of Mrs. Burgess would be incomplete. It was her nature and it made her individuality stand boldly out. But as I have already said, Mrs. Burgess was a most gracious lady, and a good neighbor. For some years my residence property adjoined hers–so I knew her well. At her death she left a will distributing her wealth liberally and widely among friends as well as relatives. She died February 26, 1923, at near the age of seventy-four. The Oster Block, on Main street, built in 1904, is another monument to the memory of Mrs. Burgess-Oster. I wanted to add my own notes. J. P. Moore has listed the first marriage as being to Samuel Boulware and this is wrong. It was instead to his brother, Thomas. I’ve been able to research this a little. The 1920 census showing Mary with her brother, I was eventually able to locate them in an 1860 census. Having found Mary in the 1900 and 1910 censuses, I reached a wall with locating her in the 1880 census and so turned to the Missouri Marriage Records. I don’t find a record for her last marriage to Schmidt, but I do find her other marriages. Missouri Marriage Records show a Mary Peck marrying a Thomas Boulware in Cass on Oct 17 1868. Missouri Marriage Records show a Mary A. Boulware, birthdate 1848, marrying Alfred Burgess on 19 March 1884 in Jackson Missouri. Missouri Marriage Records show Mary A. Burgess marrying, on 4 June 1902, Louis Oster. Thus I was able to find her in 1870 with Thomas Boulware. Samuel Boulware, son of Daniel James Boulware and Christine Pullam (I find this on an Ancestry.com tree that looks reliable) was married to a Mary E. He’s given as born 1841 Sept in Illinois, lived in Barton County, Missouri from about 1880 on, and died 1925. He was married to Mary E. in 1872. The same tree lists a brother, Thomas, as also born in 1841 in IL and gives him as residing in Bogard, Henry, Missouri in 1870 and then in Pittsburg, Crawford, KS in 1905. This is the Boulware who married Mary Peck and is seem with her in the 1870 census. The 1850 census shows both Thomas, age 9, and Samuel, age 7, in the household of Daniel and Christina in Township 4 S 6 W, Pike, Illinois. And now for Mary and her family in 1860 in Iowa. They moved around quite a bit! I’m glad I looked this up because it’s good to be able to correct here the error of Mary Peck having married Samuel Boulware, and to clarify it was instead his brother, Thomas. I was so glad to see this on here. Louis Oster, Mary’s fourth husband was my Great Great Great Grandfather. I have a copy of this from the book but it was not in good condition. Thank you so much for posting this online. We have heard stories about Mary Burgess-Oster when she married Louis and we have a picture of the two of them. We heard she used to sew and read in the mausoleum. Thanks again. Thanks for commenting with this great story, I love it!